Driving north on Ogden Avenue, just past Fry Street, you come upon a concrete railroad overpass, emblazoned with the name of your street and the year “1925.” You emerge on the other side, and Ogden abruptly ends. You have just discovered a classic example of urban planning gone wrong. Ogden Avenue is named after Chicago’s first mayor, William B. Ogden. Like many of Chicago’s major diagonal streets, it follows the path of an old trail. The original starting point of the street was Union Park. From there it ran southwest to the city limits and beyond. As early as the 1880s, plans were hatched to extend Ogden to the northeast. 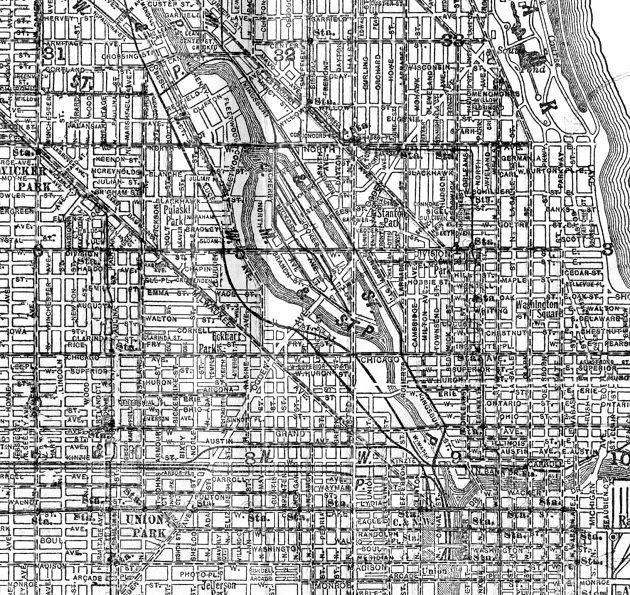 In 1903, Alderman William E. Dever unveiled an ambitious project to push Ogden through to Lincoln Park, while building another diagonal boulevard from Union Park southeast to the lakefront at 22nd Street (Cermak). The idea was to provide two speedy bypasses around the Loop. There would also be two new streets opened for commercial development. The southeast route was never built. But in 1921, the city began constructing the northeast Ogden extension. The roadway was designed to accommodate six lanes of vehicular traffic, with a separate parkway in the middle for streetcar tracks. The first stage was completed in 1925 and dedicated by ex-alderman Dever, by now the mayor of Chicago. Construction continued for several years. The most notable feature was a half-mile long viaduct, which carried Ogden over Goose Island and the Halsted-Division intersection. The street was finally cut through to its Lincoln Park terminus, at Clark and Armitage, in 1934. There it remained. Buses were becoming the favored form of mass transit, so the new section of Ogden never did get streetcar tracks. Then, the city completed its expressway system in the 1960s. The Ogden extension was no longer needed as downtown bypass, and traffic on the street steadily declined. In the area between North and Armitage, neighborhood residents now demanded that Ogden be removed–the 100-foot-wide swath through their community was a blight, and served no useful purpose. The city agreed. 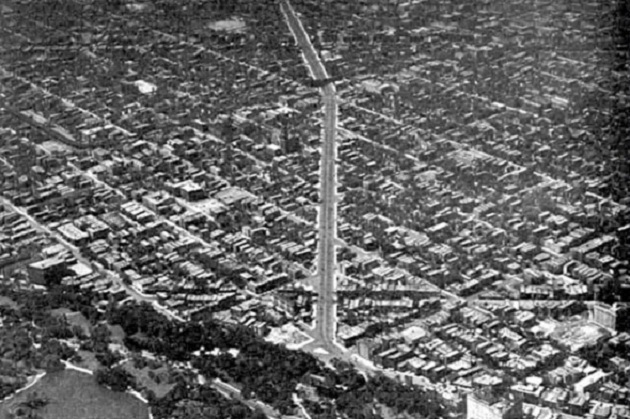 In 1969, the section of Ogden north of North Avenue was closed and built over. A few years later, the street was cut back to Clybourn. Then, in 1992, chunks of concrete started falling off the Ogden viaduct on Goose Island. Rather than spend money to fix the structure, the city tore it down. Today, except for a couple of isolated sections, Ogden Avenue halts at the Fry Street railroad overpass. That means that roughly two-thirds of the northeast extension has been abandoned–after taking thirteen years to complete, and costing millions of dollars, and requiring the removal of hundreds of homes and businesses.